These egg noodles are great for spring. Eat them as is because they are so tasty or top them with grilled fish or chicken, toss them with broccoli, brussles, avocado. Drizzle with chile garlic or oyster sauce. Done. A flan or custard. I can steep the white bulby parts in the milk, blanch the greens and line the ramekins with them. Some parmesan. Some toast. I don’t want to buy or eat heavy cream. But I like a good egg custard. Maybe a chawan mushi? A delicate chawan mushi studded with tiny slivers of chives. But it needs a small, but decadently wonderful item on top. Just one or Ryan will tell me there is too much in it. A shrimp? No. Not after that awful story on NPR about what has happened to Gulf shrimp. Blargh! But a seafood. Black cod! A tiny, $29/lb piece of black code- just a fleck on top….marinated in sake, mirin and miso…blackened under the broiler. But crap, it has to marinate overnight. Hmmm…..salmon! But maybe not chawan mushi. Maybe slow cooked, very creamy scrambled eggs. Cooked in a double boiler, flecked with garlic chives. Or maybe no eggs. Maybe just stir-fried garlic chives chinese-style. No. I want eggs. What about chinese-y scrambled eggs and salmon? And toast? Or…..noodles! Noodles made from eggs. With asiany influence. And something green. And sweet. And earthy. And sweet, sticky salmon. So I went to the store. I usually would try for an Alaskan salmon but it was $29/lb and I like to have leftovers. And, they were having a ONE DAY SALE! on salmon FROM NORWAY! and the guy behind me cooking samples KEPT YELLING to COME TRY THE NORWEGIAN SALMON! He even promised to keep my place in line. I tried it. It was velvety, rich, crazy good. Like dry skin slurping all the lotion you applied, I felt my omega reserves slurp up that salmon oil and ask for more. So I turned to the fish monger man in his rubber overalls and ordered a pound of the fatty salmon love. I then turned to the produce. Crisp, green, sweet said my brain. Snow peas. Check! Earthy. Shiitakes! And then my brain went yammering again. I will slowly steep a pile o’ chives in some oil and use it to cook the egg noodles AND roast the mushrooms. I am a genius! The salmon gets marinated first. In sake for whatever that wonderful pairing is with sake and fish. And soy and mirin for a caramely glaze…and….that’s it. Just enough love, but not too much. The mushrooms will roast first while I cook the noodles, then the oven will get cranked to broil for the fish. Streamlined. One pan- to heat the oil, to cook the noodles, to quickly toss the peas. One rack to broil the salmon. One plate to eat it all up. Ok, maybe two, because Ryan needs to eat too. And that is what I arrived home with. In just under an hour it was done. The salmon was crazy good but also crazy rich. I only ate 2/3 of mine saving the rest for breakfast. It could easily marinate longer, but that’s all the time I had and I actually appreciated how subtle the flavors were. The egg noodles had just a slight flavoring as well allowing the deep mushroom flavor and super sweet snow peas to burst through it all. I had learned the “noodle” technique while catering in the Hamptons in college. The daughter of some super VIP Chinese guest came in a day early to show me how to make them for the main dish. I was 17 and mildly horrified at the responsibility, but they turned out great and I’ve used them here and there ever since for a quick and different platform for a variety of toppings. And this was the best outcome yet. Place salmon in a baking dish. 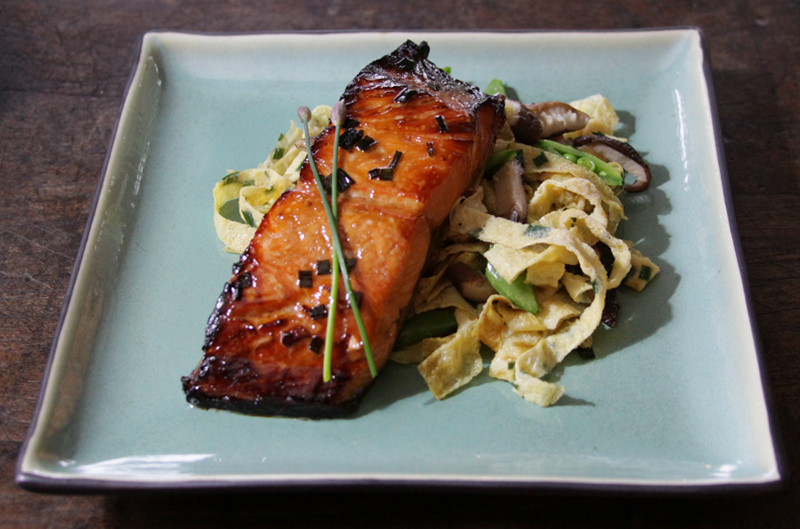 Mix all liquid ingredients, pour over salmon, and marinate salmon at least an hour or two. Put the peanut and sesame oils in a medium, nonstick pan and heat 1/2 the chives over the lowest heat for about 15 minutes. Toss the mushrooms with 1 T of the chive oil and roast for 10 minutes. Let cool then slice thinly. Turn oven to broil. Beat the eggs, mirin, soy and scant pinch of salt until completely blended. Stir in the rest of the garlic chives. Pour the rest of the chive oil into a bowl and set aside. Heat the pan over medium heat, stir the egg mixture gently and pour just enough into the pan, tilting it as you would for a crepe, until it just covers the bottom of the pan. Cook until set, flip briefly, then stack on a plate. Repeat with rest of egg mixture brushing the pan with more chive oil as needed. Fold the stack in half and cut into noodles. Drain any remaining oil from the chive mixture reserving for another use and set the chives aside. Add the snow peas to the same pan and cook until just starting to blister, tossing a few times. Cut on the bias, toss with the shiitakes and noodles and mound onto four plates. Cover a rimmed cookie sheet with foil and put salmon on a rack on top. Heat the remaining marinade in the pan on high with the reserved, cooked chives until it starts to thicken. Cook salmon in the upper third of the oven, basting with sauce twice more until crispy and glazed (about 8-10 minutes). Place on top of noodles, garnish with extra chives and enjoy. Also very good with chili garlic sauce. This entry was posted in chinese, Eggs, Fish, Japanese by Marina Chotzinoff. Bookmark the permalink.